Hey everyone! This is simple great sandwich and easy for anyone to execute! A simply amazing way to enjoy some freshly baked loaf, your favourite deli chicken and crispy lettuce with your favourite drizzle of sauce. For this sandwich, I decided to savour it with some thousand Island on the side. You might find it hard to believe but this sauce is super new in my life. Thanks to the sliders from JOEY Lansdowne. This is also one of the few instances where I enjoy the creaminess of processed sliced cheese. Of course you can try a more traditional cheese such as provolone or cheddar, to each its own! 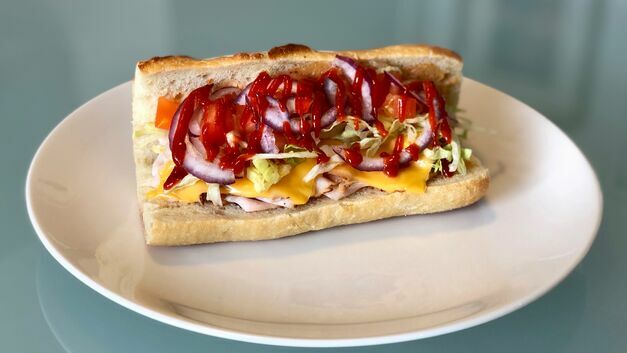 I would say regardless of how you customize this sandwich, a must is to layer the meat on the baguette, followed by cheese and bake until toasted and until the cheese has melted. Drizzle on sriracha sauce and enjoy with your favourite dipping sauce. *Cooking times may vary based upon your oven.